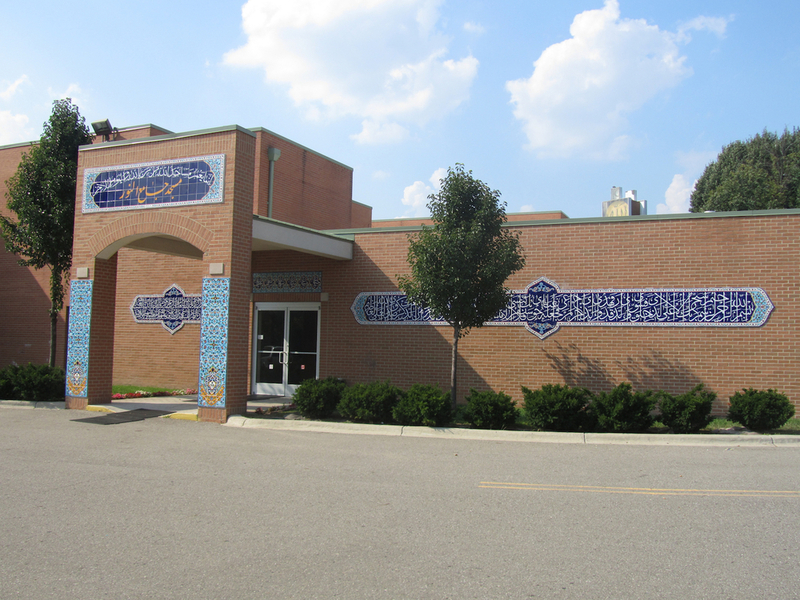 In 2013, the Islamic House of Wisdom completed an Islamic art beautification project in addition to renovating several areas of the mosque building. 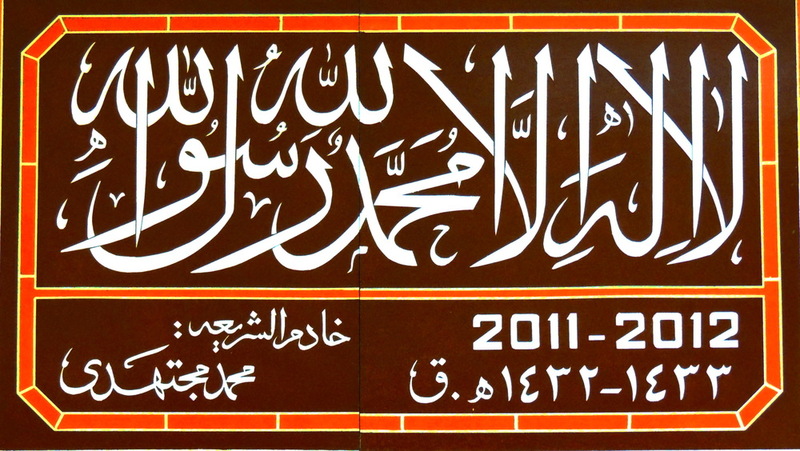 The artwork can be seen in the auditorium, Mahdi Reception Hall and Masjid. In 2010, mosaic tiles were installed (Kashi Kari) near the outside entrances of the Islamic House of Wisdom building. In the Auditorium: seating, stage areas, walls and flooring were renovated. Islamic art pieces are located on the right and left side of the wall areas that include the names of the 14 Infallible's including: Prophet Muhammad (pbuh), his daughter-Sayeda Fatima and 12 Imams (peace be upon them all). Along the top of the entry way, there is a large decorative piece that says, "Allah" (God) written in Arabic. Islamic art designs were also added to accent the lower areas of the balcony seating. In the Mahdi-Reception Hall: Verses from the Quran and Beautiful Names of God (Asma al-Husna) align the perimeter of the room- all hand painted . Lighting was added to the support columns and ceiling highlighting the Islamic Art around the room. Tiles were added to the Mahdi Hall entry way and support columns. Mirrors were installed in sections on the ceiling panels to open and add depth to the room. A large projection screen was added for use during special events. In Masjid al-Noor- a new Mihrab was installed in the front of the prayer room. The mihrab of the mosque indicates the qibla ( unifying prayer direction to the Kaaba that is located in Makkah, in which all Muslims face in the daily ritual prayers). The mihrab was delivered from California where it was designed and hand-made. The artist hand-painted the mihrab and verses from the Quran that can be seen along the surrounding walls. A beautiful bookshelf was handcrafted to hold copies of the Quran, books of dua and various prayer for use of congregants. Lighting was also added to the masjid. A large projection screen was installed at the front of the masjid for use during weekly dua recitation and special services like the Nights of Power in Ramadan. Special thanks to the artist, Br. Mohammad Mojtahedi and his two main assistants, hajj Mohammad Karimi and hajj Monir Nasrallah. Also thanks to all of the generous faithful who sponsored this expensive project! In the period of time that the Islamic House of Wisdom underwent the Islamic Art Beautification Project, simultaneous updates took place throughout the rest of the building both inside and out. The first official Muslim maghsel of Southeast Michigan was completed on the north side of the Islamic House of Wisdom building (Islamic ritual washing area for the deceased). New floor tiles were installed in the hallways of the: downstairs classroom areas, maghsal, daycare, auditorium, masjid and main door entrances. New Carpet was installed on the stairways, library, conference room and classrooms on the second floor. Many areas of the Islamic House of Wisdom were repainted including the: auditorium, masjid, Mahdi-Reception hall, classrooms, conference room, library, offices, hallways, waiting areas and giftshop. A classroom was transformed into a child-care area that is used during many programs and services. The parking lots located on the north and south of the Islamic House of Wisdom were resurfaced and lines were repainted. The landscaping around perimeter of the IHW building was updated.